5 Tips To Protect Your Hair, The Right Way! Are you protecting your hair correctly? 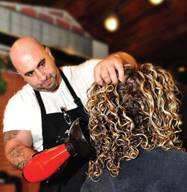 Ricky Pennisi, leading hair stylist, owner of Atelier Salon and Spa and founder of RI CI – a cutting technique and line of products developed to hydrate curls and combat frizz, offers his go-to tips that can protect your hair this summer. The “fun in the sun” season can cause great stress and damage to our hair from the exposure to the sun’s rays, salt water and chlorine. To prevent frizz and split ends, follow Ricky’s tips below. Ricky ‘s top tips on how to prevent damage! Dry, frizzy hair won’t hold a curl or style, and can even take longer to dry. Prevent dry hair by using sulfate-free shampoo and conditions like the RI CI Splash and Drench. Many shampoos that contain sodium lauryl sulfate, which can strip the hair of its natural oils leaving it dry and frizzy. to give your hair that extra bit of love. Eliminate the heat. Heat causes your hair cuticle to split open, which creates frizz. If you must blow dry or use a diffusor, set it to a medium setting. It might take a little longer, but it’s better for your hair. Always apply your styling products immediately after you wash your hair. Once hair starts to dry without products, frizz begins to set in. It is important to touch your hair as little as possible while wet. Over manipulation of wet hair that’s curly or naturally wavy will lead to frizz. Once your hair is completely dry, feel free to manipulate your hair freely. How will YOU prevent your hair from damage this summer?! This entry was posted in Health and Beauty, Lifestyle and tagged Air conditioning, Aisle, Aloe Vera, Alpha hydroxy acid, Beauty, Coconut oil, Cosmetics, damage, hair, Hair care, haircare, Moisturizer, protect, Shampoo, Sodium dodecyl sulfate, Summer, summer hair.